walked in the room holding his nose. He loudly exclaimed, what is that horrible smell? 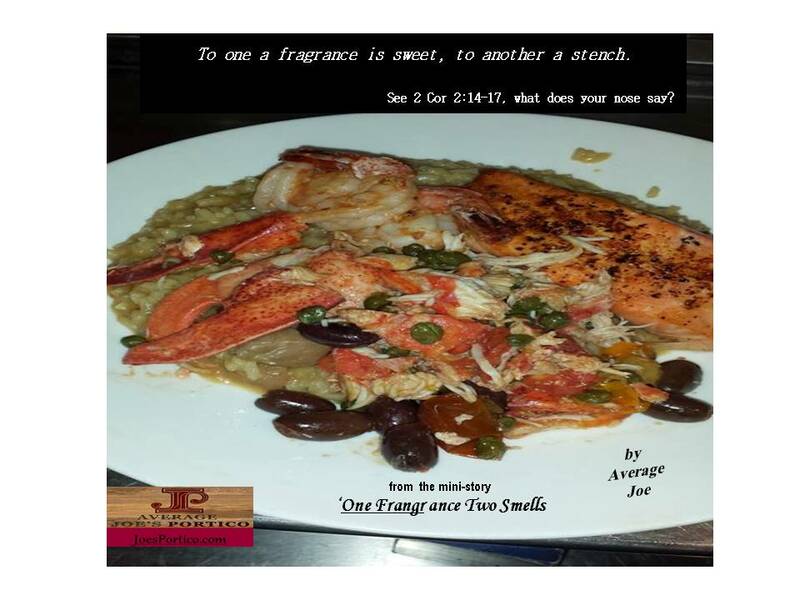 I could not believe the same fragrance produced two very different smells. It brought to mind the opposite reactions I received from varying people to the announcement of my early semi-retirement, One Fragrance, Two Smells. For the past ten years, I have been working hard to be in a position to retire from the corporate world earlier than the traditional 65. I have always had a heart towards being freed up to spend more time volunteering, which always suffered due to heavy work demands. Years ago, we spent much time as a family working in pet rescue agencies and local humane centers. As my life transitioned, we encountered so many struggling with their finances, worrying about their kids, worrying about everything, and thus we began helping some. We soon found that finances were only one of many areas people where people need assistance. While helping a number with their personal goals and struggles, we knew we had to set an example first. In order to help average people see that one can be worry-free and even financially independent, we had to prove it. How do you tell people you are good at providing life advice while being broke? Impossible and hypocritical would be my answer. The old joke of what does a broker do with your money? They make you broker. That is not what I want to be. I also knew that spending my life in the everyday grind was taking a tremendous physical and mental toll on my mind, body, and soul, I could see the signs it was starting to send me down to a place where I did not want to end up landing. The goal started to become a reality a few years ago, but five years longer than I would have preferred. Moreover, to set the record straight, we do not have gazillions of dollars; we live frugally and always have. We put money away and learned how to save and invest. Like everyone, we have made some really bad moves and some good ones. We took some risk and made some safe moves. We have had some really good fortunes and some really bad ones. My advice comes mostly from the bad ones. Finally, the goal was reached and things have fallen in place to be able to live without total reliance on a paycheck. In announcing our intentions, I received many positive comments from people. Many congratulated us on reaching a goal many people hope to reach (we’re not the first either). I made no bones about it that at the same time I have reservations, as this is a risk. If something goes wrong, I will be at Wal-Mart handing out smiley stickers. Those who smelled the positive were behind us completely, especially to those who understood the faith element that goes with the rest of the story. I thought I made it clear this was a semi-retirement maneuver. It is loaded with hope to fulfill an urging from childhood to write and have a positive impact on a person or two, preferably more. I can only hope a few people benefit. Just like my son’s reaction to a meal I thought was fantastic, some others saw it differently. Reactions behind the back included ‘what an arrogant jerk, flaunting money around’. ‘I wish I could retire early too, hope he falls flat’. ‘Let’s see where that faith gets him when the first medical bill pops up.’ One fragrance, two smells. One of the premier items to grab hold of in sales is to gain a strong backbone. People will reject you and the products you sell for various reasons. Some of them are very legitimate, some with underlying motives, and some that make no sense. I had one person whom I could never figure out why everything we sold was always inferior to a competitor of ours. Only after he left that company did I find out that his brother worked for that competitor. Of course, the result was a negative review for me and for every product and service I represented. For people-pleasers and us worriers, we have to learn that we are never going to make everyone happy. We will be misunderstood by some who translate quietness as being stuck up or into ourselves. When we finally become a little bit bold and say something, people will see us as ‘not humble’. When we attempt to say something about ourselves for the sake of motivating others with low self-esteem, by some it will be deemed as arrogance. Remember, One Fragrance has Two Smells. We do not need to read very far into the news or watch on the tube to see two completely different viewpoints regarding every topic. On one side, people saw Barrack Obama as the greatest President in history; on the other, they see him as the worst. Only two months into his term opposite views are made about Donald Trump. Half of the people love the one and hate the other. If either of them spent all their time focusing on only the opposition, they would accomplish nothing. Christians, why are you surprised at the opposition? I personally do my very best to present my beliefs in a soft manner, yet I know there are people who see my step of faith and trust in God as ludicrous. I mention ‘somehow’ we were blessed to be able to quit a job to pursue a ministry that will not be paid for by donations. Oops, that is the other viewpoint, some say, why are their so many ‘church employees’ paid by donations? Shouldn’t that money be going to help people and not pay for building and program care? Or, ‘never listen to someone that does not have credentials’, as if being hired by a church suddenly makes someone an ordained lawncutter. Without any doubt, we did not have a special skill-set or natural gift; where we are today is all to God’s glory and grace. I suspect that to some that is an unpleasant aroma statement. Giving up a career and living the rest of your life serving God – To the church goer that is a dream-fulfilled. (especially if you can get paid for it on top of it, even if a small salary). To the person living in the world of money and prestige, it is stupidity. While I want to do my best to humbly carry a message that has changed my life and brought on at times some blessings, and others some really bad things (if you missed the last mini-story all is far from perfect for all including Christians) I will at times present things that some may not like. I cannot make an apology for telling truth. If I appear arrogant, it certainly is not intentional, but I know to some regardless of how hard I try, it will make no difference. May the message of God’s love be a blessing to all who read. However, I know we each will receive it differently. I understand that with One Fragrance there are Two Smells.